The wind is howling this morning. It howled last night and for the three nights before that. Wind signals change. Something is blowing out and is being replaced by whatever is blowing in. By the time whatever is on the way actually arrives the wind will have wreaked its havoc. Broken planting pots, fallen garbage cans, branches and leaves are everywhere. This wind leaves behind the debris of change as it blows in something new. And I suspect that something new is the summer season. I stare out my window at the crystalline air and the specular brilliance of long days. The leaves of Vicky’s birches have gone from chartreuse to emerald. The sun invades this normally dark room like a cop-car spotlight. Preferring a hobbit hole in which to work, I’m stuck in a perpetual high-noon squint. The sun chases me around the room all day. First here, now there. The calendar says that summer is yet three weeks away but the light and the summer wind tell me something different. There’s no more hiding in my winter cave. Whenever summer arrives I think of winter. My brain just works that way. I think of long nights and glowing windows. And these days, having spent the past, two holiday seasons there, I think of Venice. This howling and bright morning has me dwelling upon a still and foggy morning of this past December. 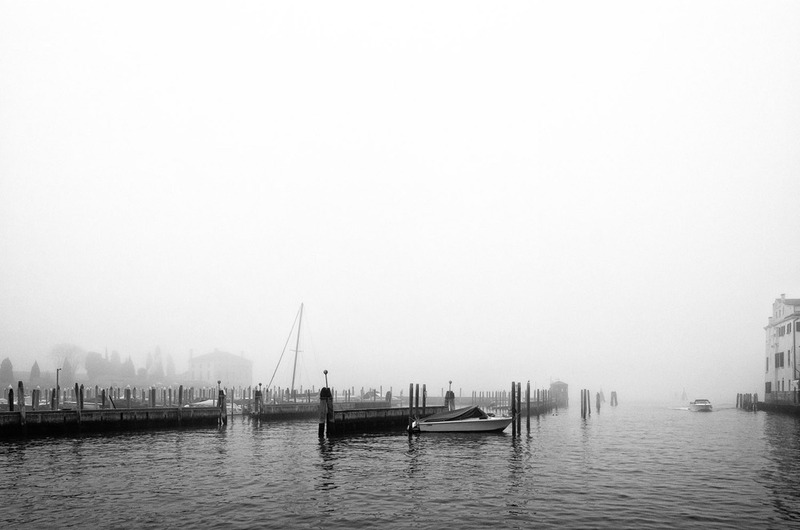 On that day I stared at the encroaching fog of the Venetian lagoon. As the fog slowly enveloped the canals I watched the ancient city fade into ghostly shades of white and gray. It was as happy a moment as one might experience, filled with the sensation of being present, aware, and fully enveloped. But, now in this new moment I am awakened from my Venetian dream. The summer wind still howls for my attention, as if it were an insecure child. My Venetian dream is put on hold as I go outside to chase the garbage can lid one more time.